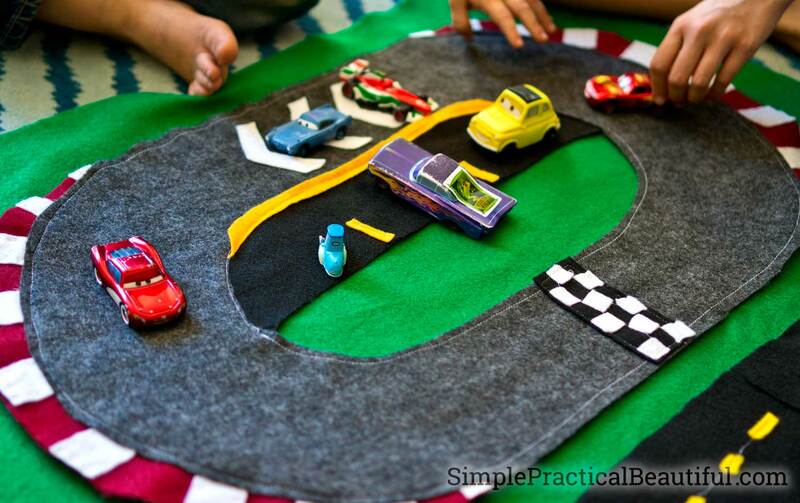 The Disney Pixar Cars 3 movie inspired this easy DIY felt race track and city with roads and a dirt track. Free printable template included. 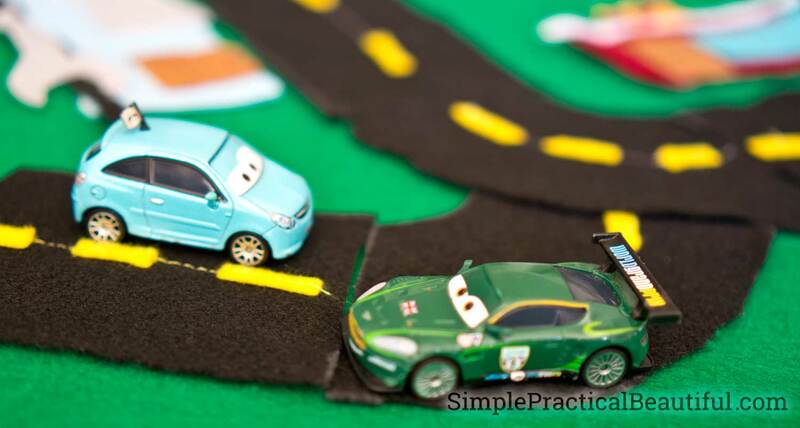 It’s perfect for your Mattel Cars toys to drive on. Anyone who likes the previous Disney Pixar Cars movies is going to love Cars 3. The animation is incredible. There are so many details like water and fog and the debris on the race track that looks as realistic as a photograph. And the cars are the same beloved characters from the original movie, only we see them grow and develop even more. Cars 3 is a fun movie for the whole family. My 3 year-old is obsessed with the Cars movies and Lightning McQueen, so we decided to make a Cars race track and a whole city for him to drive his Mattel cars around. 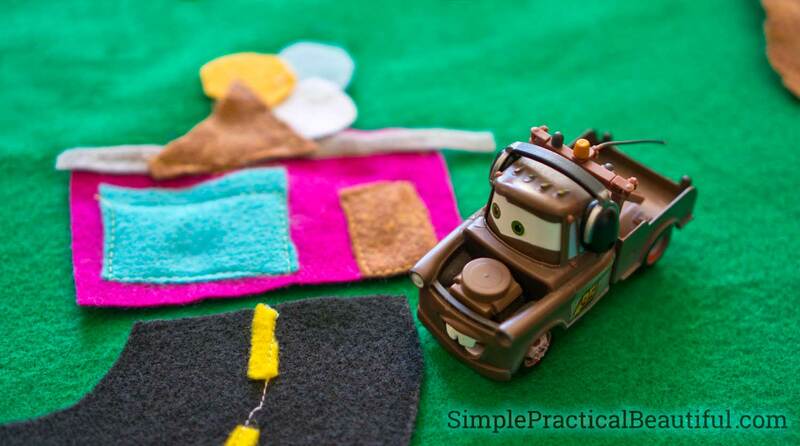 We made it out of felt because felt is really easy to work with and really easy for my preschooler to create his own little world. The only thing you need is felt, lots of felt, especially green and black felt. Grey and brown felt are good too. 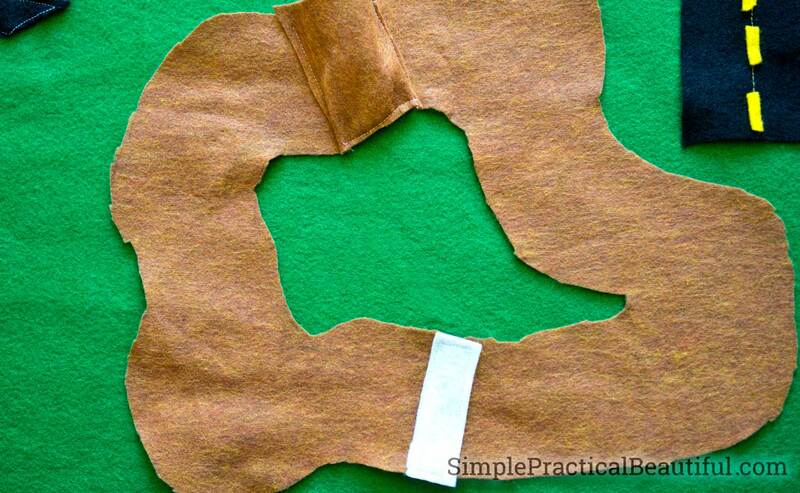 You can sew the parts together by hand or with a machine, or you can glue them together. 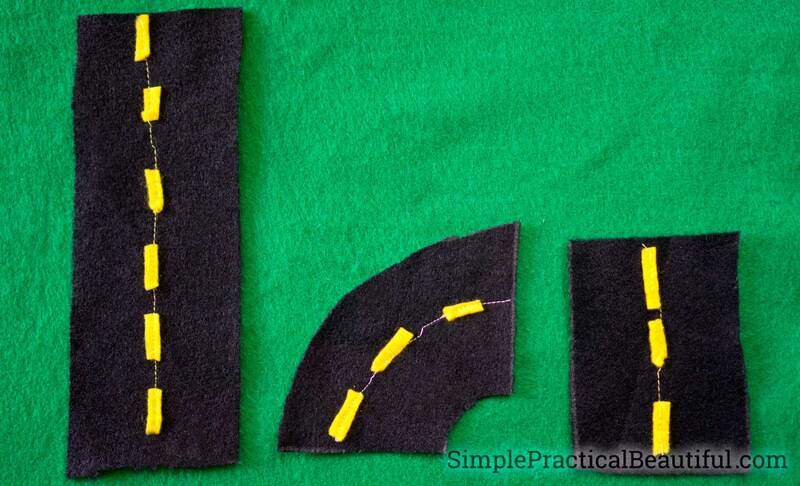 Fabric glue will make the pieces a little more bendable, but plain school glue will work too. We chose to sew everything with a sewing machine. 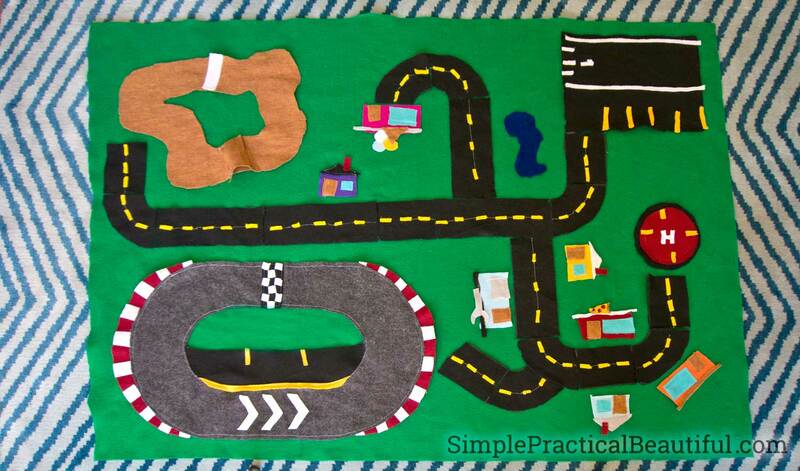 Actually, my 9 year-old daughter cut and sewed most of the city and roads, as a birthday gift for her brother. 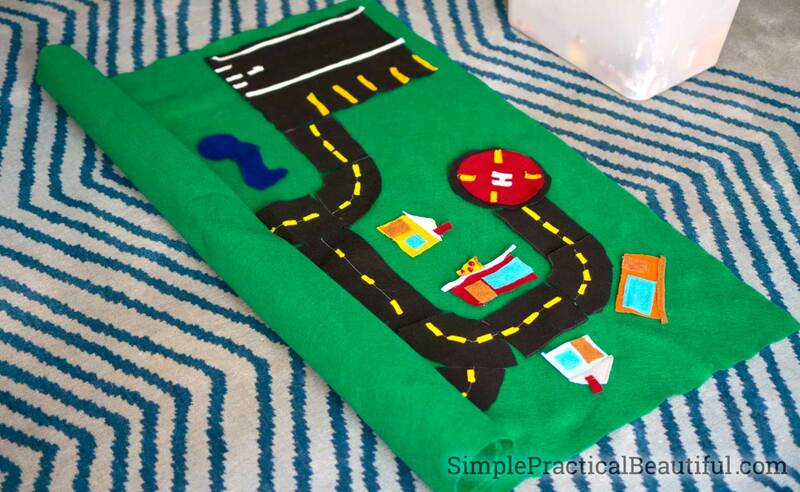 I share that so you know that you don’t have to be an expert seamstress or crafter to make this. Felt is easy to work with and easy to get creative with. And my 3 year-old Cars fan loves it, flaws and all. 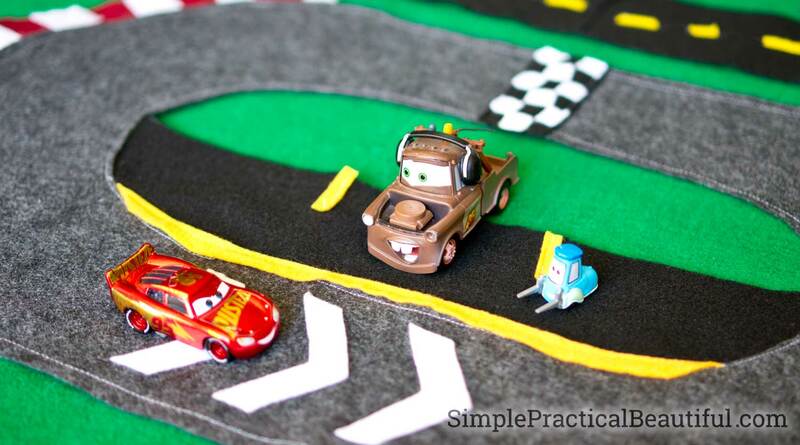 The racetrack is the most complicated part of the whole city because we figured it was the most important part to racecar Lightning McQueen, so we wanted it to look good and have lots of fun details. It has a checkered finish, white direction arrows (cars always turn left on a race track), an area for the pit crew, and checkered banks or curves. 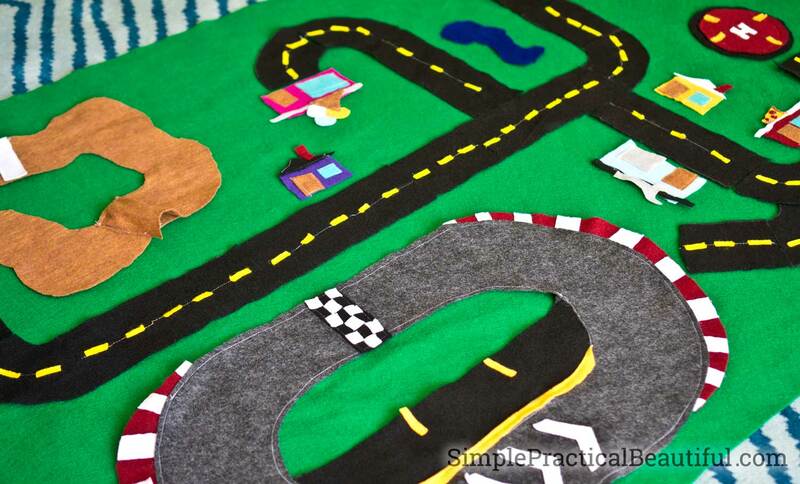 Click here to download a free pattern to make the race track. There are three shapes that we repeated: the basic road, a 90 degree turn, and a long road. My preschooler uses those to build whatever city he wants. We should have made the mud track in the shape of an “8” to be like the Thunder Hollow Crazy 8 race in Cars 3, but my daughter actually made this track to be a monster truck course. 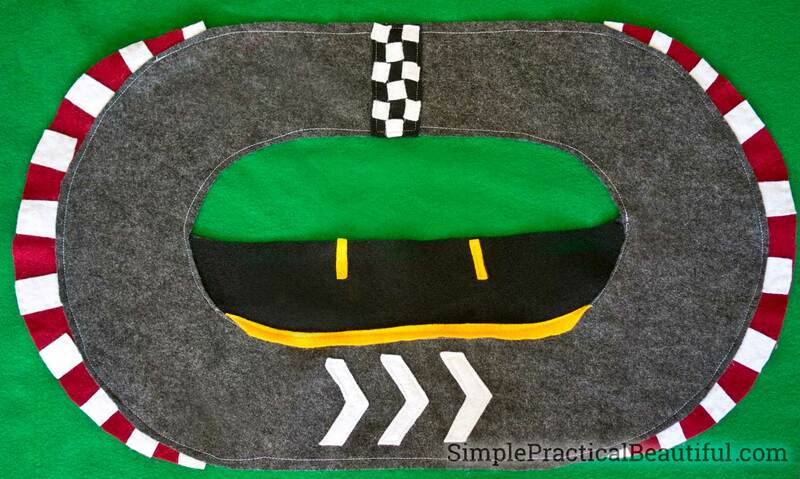 The dirt track has a white felt starting line sewn on and a dirt mound made from the brown felt. It’s made like the top of a pillow so that it can be stuffed with tissue to make the mound bigger. All the track is missing is the exploding tires. The airport is a small rectangle with parking spots for the cars, and a runway defined by white felt for the airplanes to take off and land. There’s also a number “1” in white felt, so that the planes know which runway to use. 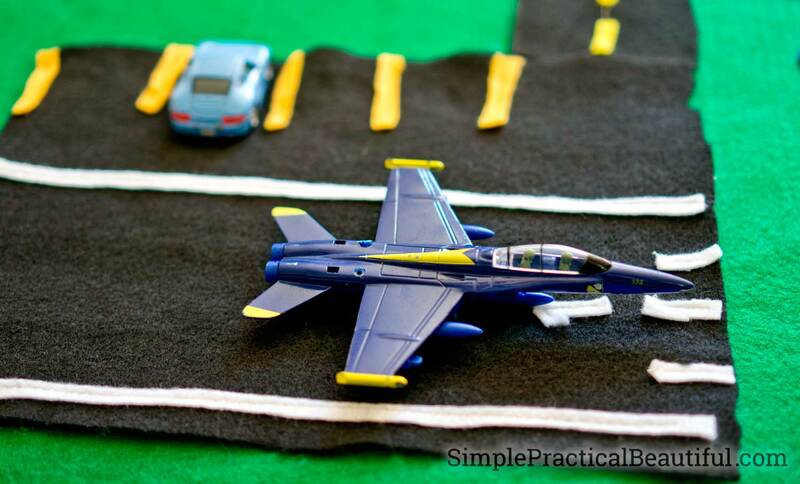 We don’t have any toys from the Planes movie, but we do have several toy planes and jets that use the airport. 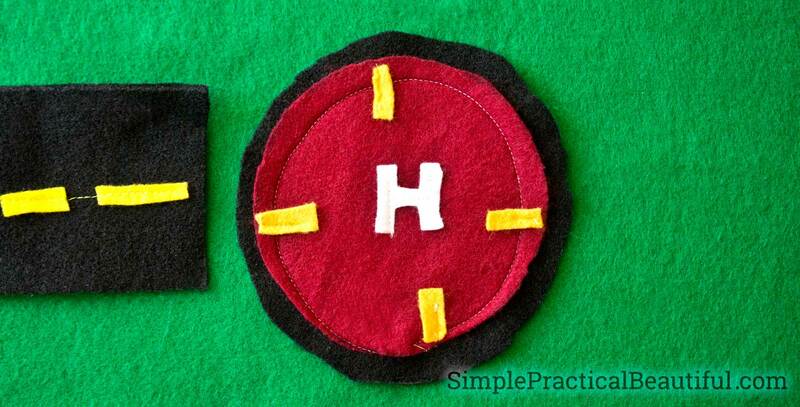 The helicopter pad is just two circles, one black felt and one slightly smaller red felt circle. 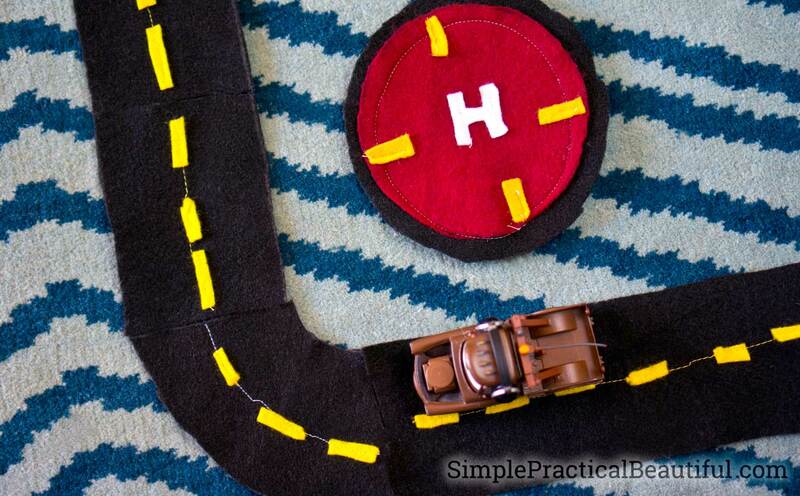 There’s a white letter “H” in middle with yellow stripes (left over from making the roads) for a fun detail. My daughter just cut out various sizes of rectangles to make them. A larger rectangle, in any color, makes a house, and smaller rectangles make doors and windows. A triangle makes the roofs for the houses, and a long, thin rectangle make the roof for a store. Mater’s favorite store is the ice-cream store, according to my preschooler. My daughter made felt shapes to identify each store, no words necessary. 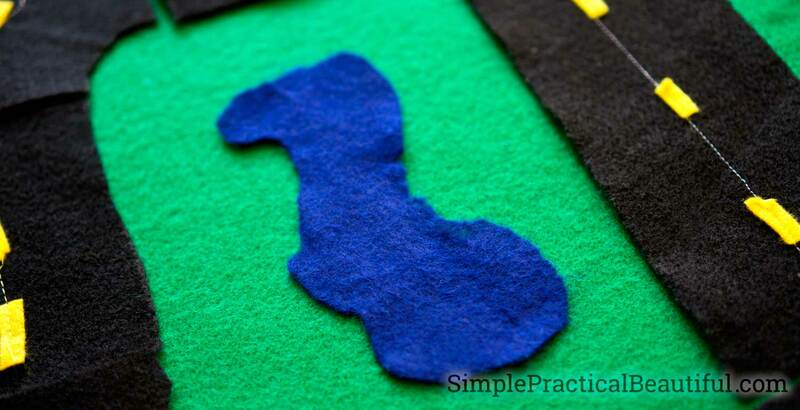 The lake was the easiest part to make, it just a rounded shape cut out of blue felt. My daughter also plans to make trees and bushes to go with it. Felt sticks to felt, so the whole city is easily built, and moved around, on a large green piece of felt. The mat is just a yard of green felt from the fabric store. Everything can be laid out and smoothed down. The best part about the mat, is that I can roll the whole things up, pieces and all, put it away, and get it back out the next day without “messing up” the city. Although, sometimes my preschoolers just plays with a few pieces on the carpet. Felt sticks to carpet really well too. 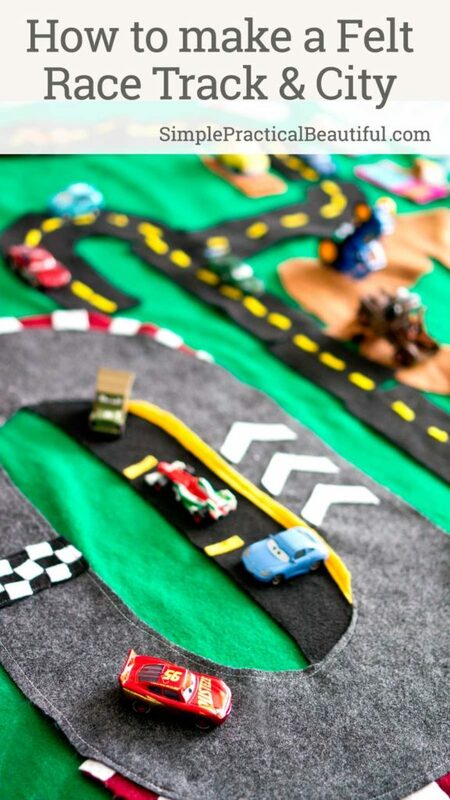 All of my kids have so much fun designing, playing, rearranging, and imagining with our Cars felt race track and city, especially after watching Disney Pixar’s Cars 3. How big was the piece of green felt? It’s a yard of felt from the fabric store, which is 36 inches by 54 inches, I think. This is awesome! Do you by chance have a template/pattern? If So, I’d love it if you are willing to share it. Thank you so much for asking! I can’t believe I forgot to add a link to the pattern. I added the link in now, just above the picture of the race track. The race track is the only part with a pattern. For the rest of the pieces, we just made them up as we were cutting them out. Impressive design! I want to buy this play mat for my daughter.